« Homepage / Products I Like / "Vroom My Mom Time Away"
Anyway, Vroom is the perfect tool for moms who are like me. No, not the disorder, silly. I meant those who likes to have their house pristine. 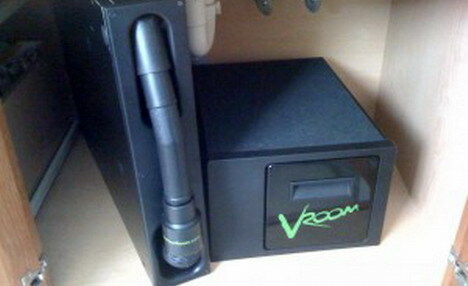 Vroom is a small, but powerful vacuum that cleans up a mess in less time it takes to find a broom or get the cleaning supplies. And in my case, much lesser time it takes than grabbing a tissue and grabbing those nasty hairs and dirt on the floor, EVERYTIME I go to the bathroom. I love the fact that it installs in the kitchen or bathroom cabinets so I can just use it EVERYTIME I need it. It’s so convenient since it’s there all the time. It comes with the 24 ft. retractable hose so you can cover a whole lot bigger space to clean. And because the suction is so powerful, it comes in handy when chasing kids too, HA! Vroom comes in two types of systems. One that you can connect to your central vacuum system, and one that’s freestanding and works in any home. I got the freestanding system, courtesy of Vroom Solo and Twittermoms. My kids thought it was a CPU when they first saw it. They thought my 3 laptops are not enough that I’m installing a computer in the bathroom, LOL! Assembly is so easy, I can definitely do it by myself. But since hubby’s there, I just pretended to be dumb and helpless so he can do the work. I just wished my cabinets were deep enough to fit the units perfectly. In my case, they were in a slanted position as you can see in the pic, because we couldn’t close the doors if in the straight position. I guess my builders were following a different set of standards, arrrrgh! Other than that, Vroom is my new BFF in the bathroom and will be spending a lot of mom time together. I know you’re jealous. Who wouldn’t be? But I haven’t forgotten about my hot mom community… Vroom is giving away a FREE unit just by registering! Yes, that’s all you have to do. It’s the easiest contest you’ll ever join. So stop being jealous and head on over to Vroom and register to win! Here you can write a comment to the post "Vroom My Mom Time Away"